We all know it– have your camera ready at all times because you just never know when the right moment will strike to capture your favorite photo of the day. On a recent day of apple-picking in Pennsylvania, such a moment happened. I watched as a man walked a horse back into the horse corral and followed behind him. 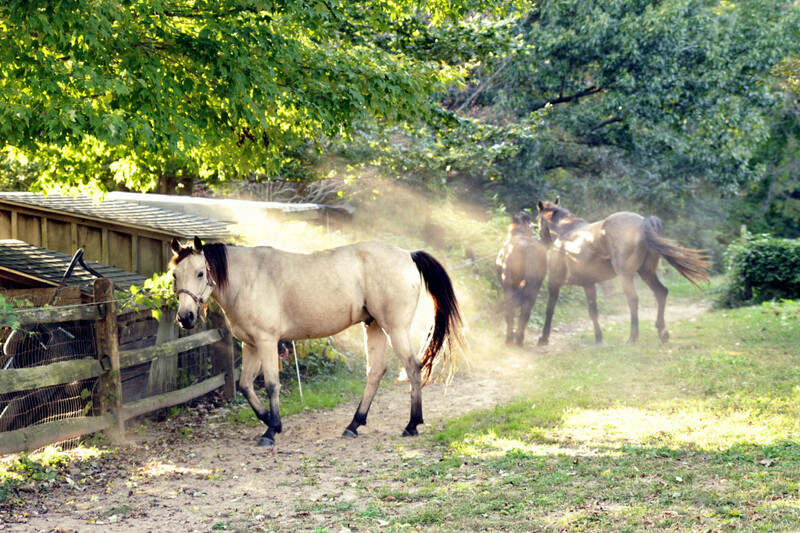 I quickly zoomed in on the horses already in the corral, but as soon as the new horse entered, they galloped off leaving a cloud of dust that reflected in the low sun streaming through the trees. I snapped off three images, and then this horse just looked at me for a second, and then he galloped off right behind his friends, two more shots. This was the last one. I had no time to think about settings, so whatever my camera was set on from my previous shots was what I caught this image at. I usually keep my camera in aperture priority in the F/5.6-F/8 range and my ISO is almost always at 400. So for this shot, the shutter speed was just fast enough to freeze the action.So the lesson today? Look around you for activity beyond what you came to shoot and watch for those special moments. Try to anticipate a shot when you see some activity around you. And when out for the day, keep your camera handy. If my camera was in my gadget bag, I would have missed this altogether. My favorite shot of the day. This entry was posted in Travel and tagged travel, vacation by stacieerrera. Bookmark the permalink.